Cara Sue Achterberg is a writer of three novels, a self-help book, and a memoir. She is also a blogger, journalist, a wife and mother, and a serial dog foster mother. In Living Intentionally, Achterberg shares stories, ideas, resources, and even recipes to help readers live a fuller, healthier and intentional life. The book came out in 2014. Achterberg published her first novel, I'm Not Her, in 2015; her second novel, Girls' Weekend, and third, Practicing Normal, both came out in 2016. 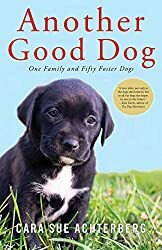 In 2018 she issued Another Good Dog: One Family and Fifty Foster Dogs, a memoir about her family and family-life caring for foster dogs. Visit the author blogs HERE … and HERE. 1. The author describes the pain of losing her beloved hound of 17 years as having "left a gaping hole" in her family's "collective heart." Have you experienced the loss of a pet? What makes the loss of a creature so profound? 2. How easy or difficult would you find fostering dogs: taking them in, caring for them, and having to let them go? 3. Of the many dogs the author fostered in Another Good Dog, which ones were your favorites? Which dogs would have been hardest for you to say goodbye to? Were there any you would have glady (or reluctantly) given up on? 4. Talk about some of the particularly tough challenges she faced—perhaps working with dogs traumatized by cruelty …or the job of weaning nine puppies. 5. Achterberg talks about "how bad my addiction [to fostering] had become," a habit that was testing her marriage and her husband's patience. Did you feel any sympathy for him? Or were you impatient with his complaining? 6. Follow-up to Question 5: Achterberg faced other family complications, including her son's health issuses and her daughter's beauty pageant. How difficult was it for the author to juggle the various demands placed on her from all different directions? Did you ever reach the point where you felt she had over committed herself—that her husband was right to present her with his enough-is-enough ultimatum?